I was able to get in on the investor conference call, the particulars of which I won't report on too much because I'm sure other comics sites will do a better job of covering the specifics. But I do feel obliged to comment on things in general. First, I expect a lot of comic fans will voice concern (possibly outrage) about how Marvel will become part of the giant corporate machine that is Disney. Setting aside the assurances the execs made during the call, such concerns are entirely unwarranted. Why? Because Marvel itself has been a giant corporate machine since the 1980s. Not to the level of Disney, certainly, but Marvel really became a licensed property company under the helm of Jim Shooter. Secret Wars was, after all, an idea that came from Mattel for a toy line. Spider-Man and His Amazing Friends brought many Marvel characters to people's attention in a much more successful way than had ever occurred in prior cartoons. Shooter saw, I think, the direction where things needed to head for the company and steered in that direction. One can argue his and subsequent EIC's relative success, but that's clearly where the company's been headed for some time, and really came to the fore in the 1990s. Despite still having a veneer of "the house that Jack built" the friendly, devil-may-care approach that Stan Lee epitomized hasn't actually been in place for years. The next issue I might bring up is that Disney has a great set-up currently. Not much to dispute there. But they're reached an effective saturation point. As one of the most globally recognized brands in the world, with one of the most globally recognized characters in the world, it's almost impossible to get further market penetration (i.e. growth). Think of them like Microsoft. Everyone who was ever planning to buy a computer with Windows on it has already done so -- they can't really sell you ANOTHER one. So they buy up companies that own another product you can purchase. Disney is pretty much in the same boat, in that they can't really get you to buy MORE movies or princess outfits or whatever. But they can partake of the profits from another company whose material you're already buying. From Disney's perspective, it's a pretty simple growth strategy and, if you could read between the lines, they essentially said that on the investor call. There were questions brought up about company synergies and existing movie distribution deals and such, and everyone repeatedly said that the deal really wasn't about any of that. 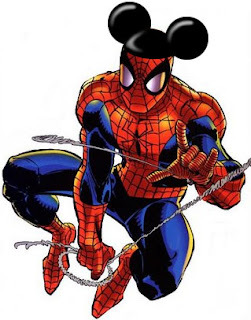 It was simply that Disney had seen Marvel do a great job with their characters from a business perspective (they seemed particularly impressed with how Marvel was able to turn Iron Man into a household name almost overnight) and they wanted in on it. I took note of Marvel becoming a "character-based entertainment company" instead of a comic book publisher almost a decade ago, but most people still seem to be under the impression that comics are still their main business. Disney isn't going to do anything with Marvel other than rake in profits. They might facilitate some new movies or TV shows down the road, and you'll likely see Marvel characters popping up in more retail outlets, but comics are the least profitable part of Marvel's business. Disney doesn't even have an incentive to screw around with that. So, after you pick your jaw up off the floor from the announcement, just relax; Spider-Man and Wolverine aren't going to be doing anything different than they've been doing for the past decade or three. Do you predict this having an impact on distribution and /or the direct market? When I first heard the news I was hopeful that Disney was going to clean up comic book distribution and the direct market (Because why would a company the size of Disney put up with Diamond's shenanigans? ), but then I remembered that golddarn Warner Brothers owns DC and they don't do anything about it. Comic book publishing was probably the last thing on Disney's mind when they bought Marvel. Disney won't do anything about Diamond. In the first place, Disney comics have been around for years and they've put zero effort/interest in them. Which is pretty much their historical model for dealing with comics (that's exactly how Carl Barks was able to do as much as he was, in fact). The subject of comics was broached exactly once during the investor call, and it was the form of a question from one of the investors. The Disney execs pretty much dismissed it out of hand, and spent much of their time focusing on movie properties and deals, with a secondary interest in retail/licensing toys and clothes and whatnot. Comics were totally a non-issue. I want to see Pixar-quality superhero epics.